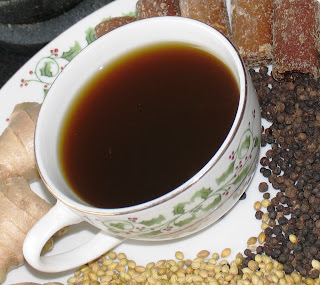 Inji kashayam, a medicinal drink made with fresh ginger,pepper,coriander seeds and jaggery.This is mother in law's famous recipe to make us all feel better when we are down with cold,indigestion or even nausea.Simple and easy to make and this is my entry for JFI-Ginger by Rosie. Crush ginger in a mortar.Add water in a sauce pan and heat it.While its heating add ginger,coriander seeds, pepper and jaggery.Bring this to a boil and let it boil for about 5-6 minutes.Sieve it through a tea filter.Serve hot to feel better. Tips : While buying ginger, look for the longer ginger root 'cause, the longer the ginger root, the fresher it is. This drink reminds me of what my nani gave me when I was sick. I think she called it Kadha (kar-ha). I was looking for this recipe. Thanks for the kashayam recipe. I am sure it will be really useful for this cold winter. Blogger gave me lot of trouble today,just came back from the Dentist and couldn't open my blog! A beautiful entry to the JFI. We add honey instead of jaggery. A very effective homemade remedy indeed! kashayam recipe is good..thanks for sharing.. I will try this kashayam, hope this will make me feel better with my throat infection. Exact recipe i was looking for.